More than 40 percent of Americans make New Year's resolutions, according to Forbes. However, fewer than 8 percent of that group actually achieve their goals. For founders looking to improve their lives and companies in 2017, one important factor can help significantly decrease the risk of becoming part of the 92 percent of goal-setters who fall short. Dr. Anders Ericsson, the professor behind the often-cited “it takes 10,000 hours to become an expert" study, cites motivation as the single most significant predictor of success. Although it may seem obvious, taking into account the role of motivation can mean the difference between a well-intended, unmet goal and a carefully-executed behavioral change. Because intrinsic motivation is so important, there is no preexisting New Year's resolution list that's going to be perfect for you, even if it comes from a business leader you admire. That's why frequently-touted SMART (Specific, Measurable, Attainable, Realistic and Time-Driven) goals that are not supported by internal motivation aren't extremely successful in practice after all. However, by examining your own current situation and motivation, it's possible to put together a perfectly-curated list of behaviors to improve your life or business in 2017. Schedule at least 60 minutes of uninterrupted, device-free time on your calendar to examine your own internal motivations. Reflect on the growth and challenges you encountered in 2016. What went right? What went wrong? With a pen and paper in hand, complete the following sentences. Don't rush through the exercise. Use the full hour to really examine your desires. The number one professional goal I hope to accomplish in 2017 is ________________. This is important to me because ______________. The number one personal goal I hope to accomplish in 2017 is ________________. This is important to me because ______________. To accomplish my big-picture vision for 2017, I must actively focus on _____________________________ . 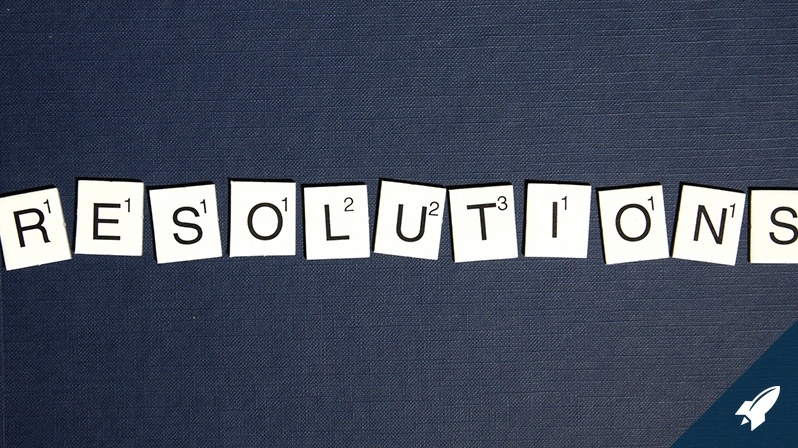 Upon completion of the above exercise, your five resolutions should be clear. The five changes you make to your daily (or weekly) schedule, considered collectively over the course of the year, will play a measurable role in your success. Because the motivation behind each behavioral change is clearly tied to an internal motivation, you're already setting yourself up for success. Refer back to the written statements when you find yourself in need of encouragement. Studies have shown that those who write down their goals are more likely to achieve them. There are other benefits to written goals, too. The “this is important to me because" statement that accompanies each goal is especially important because it reminds you of why you are focusing on making the changes and keeps you connected to the bigger picture. To further improve your odds for making lasting change, tell someone. Accountability buddies may be even more important than mentors in goal achievement. Better still, complete this exercise with a friend (but still fill out the prompts individually) so you'll have a partner to discuss progress with throughout the year. Lastly, with any goal, it's important to remember to be kind to oneself. Founders tend to hold themselves to nearly-unattainable standards, which can lead to negative and destructive self-talk when they fall short. Instead of judging accomplishments against perfection, try to reframe the situation to appreciate the progress made. “Progress, Not Perfection" is the golden rule to remember on the path to achieving any goals — including New Year's resolutions.